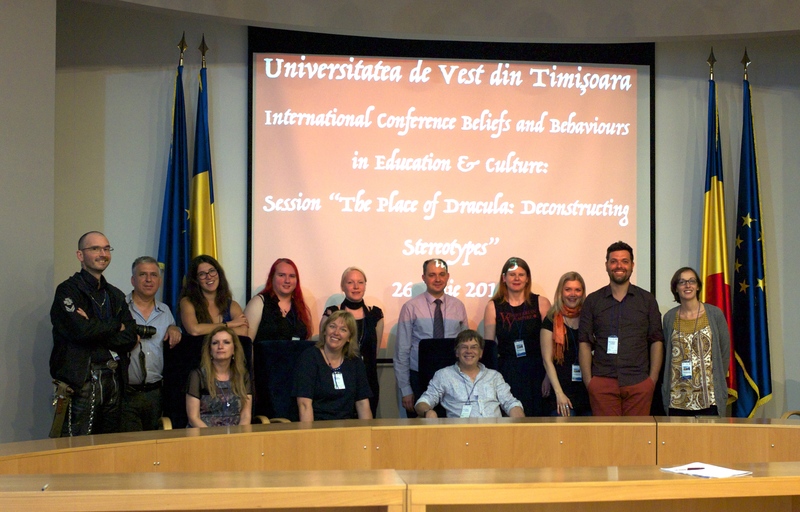 Last week, I attended the International Conference Beliefs and Behaviors in Education and Culture in where I was a presenter in the workshop titled: Where’s the Place of Dracula: (De)constructing Stereotypes in the Study of the Mythical Space in Literature and the Arts. The conference was held at the West University of Timișoara, Romania. 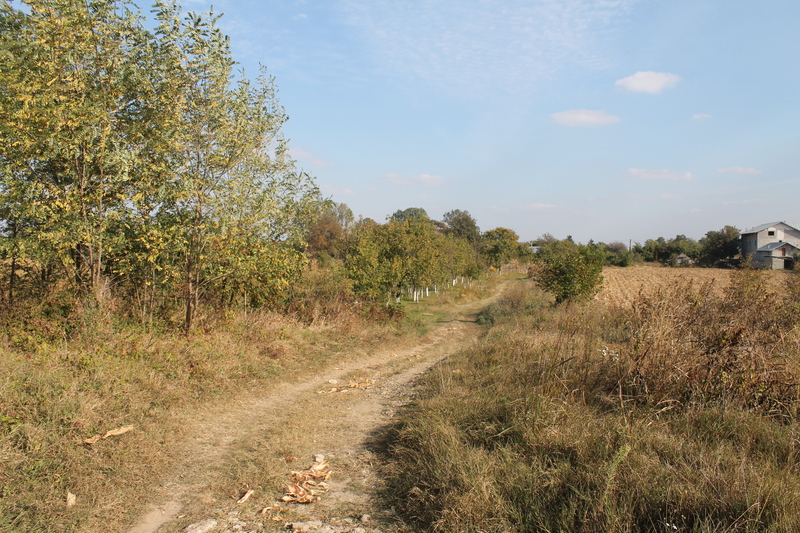 Everything from the actual conference to the tour of the Romanian countryside was absolutely amazing! 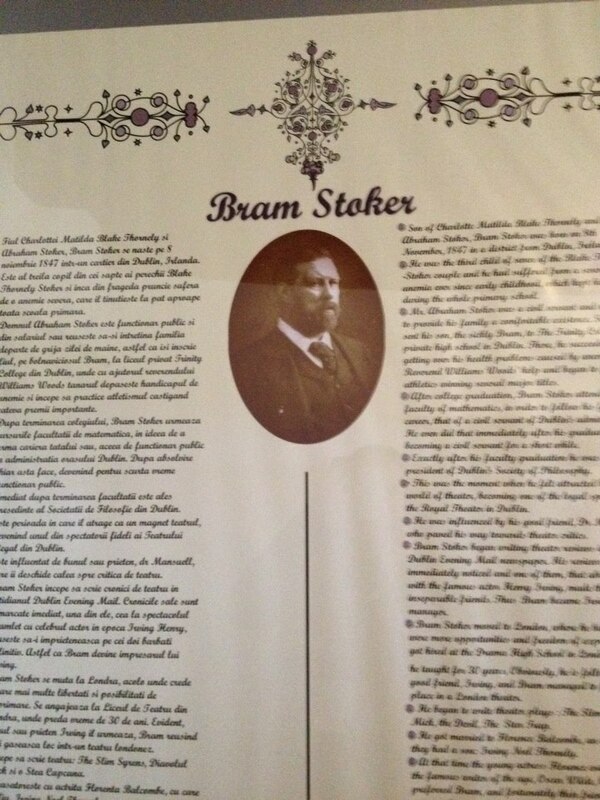 And what better place to hold a Dracula conference than in Romania, where Stoker set his famous novel. However before I went to Romania, I first decided to spend a few days in Munich, Germany, a country I had always wanted to visit. After landing in the city, my first full day was spent exploring downtown. 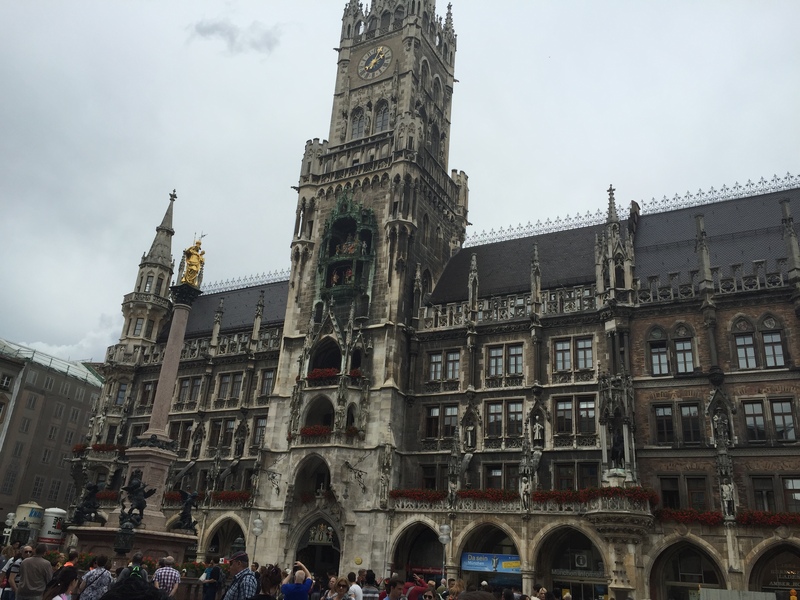 Sights included: Marienplatz, which is a plaza showing several beautiful examples of Gothic architecture. It was referred to by one local I spoke with as the ‘Heart of Prague’ and a glance at the magnificent structure which forms the center of he Plaza, I could easily see why it would be referred to in such a way. 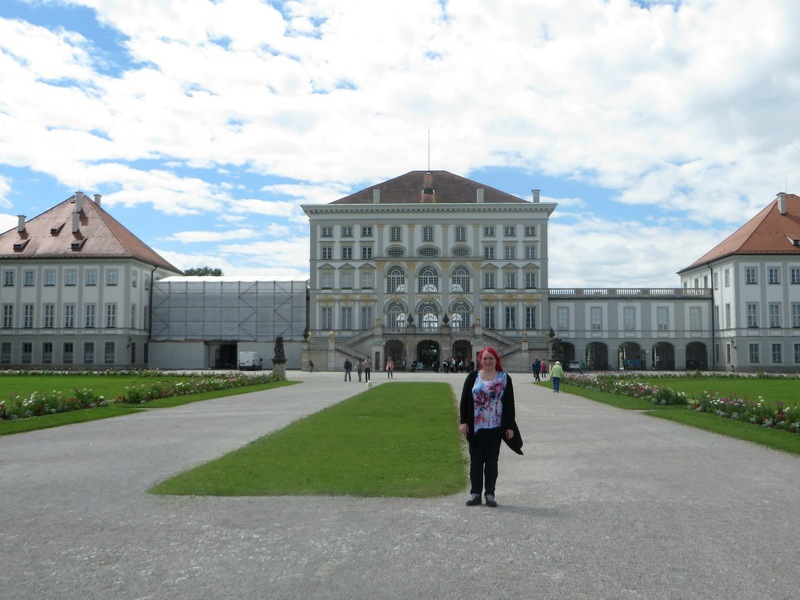 We also went to the Residenz Munchen. 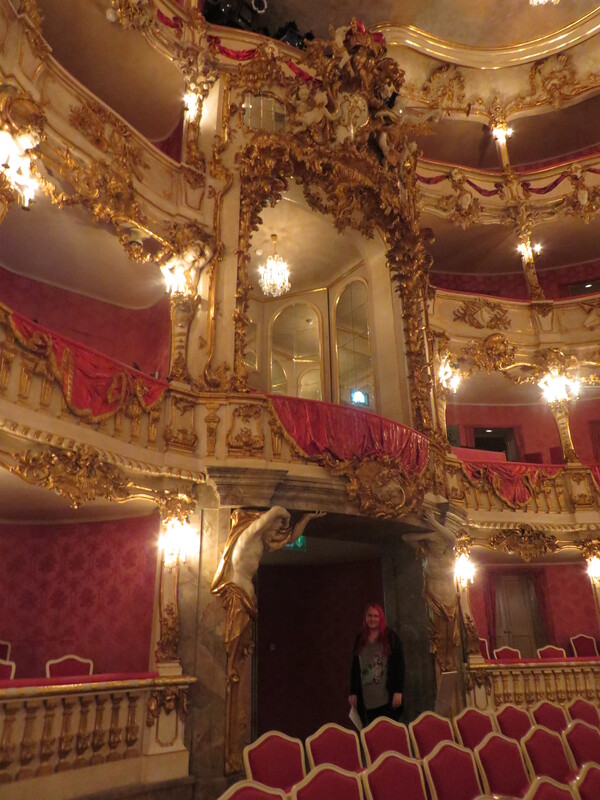 composed of a series of elaborate buildings consisting of the households of important figures, elaborate artwork, to an opera house which was by far, my favorite of the buildings I was fortunate enough to view. We met my friend, Hans, for lunch. He is photographer, fellow writer and Dracula scholar, author of several Dracula research books including the Dracula Bram Stoker Travel Guide, a project he is working on with fellow author, Dacre Stoker. To the garden which featured statues of the Greek Gods. It was a special site for me, as a lover of classical Greek and Roman history and literature. Altogether, we spent three wonderful days in Munich before heading back to the airport for a thankfully much shorter flight, to Timisoara, Romania. The conference organizers were kind of enough to arrange transportation, so all of the conference attendees had rides awaiting them to their respective hotels, which was very much appreciated. The conference itself was filled with speakers on various subjects dealing with various issues concerning everything from the education system, to contemporary issues facing Romania and surrounding countries, to what I had been invited to speak on – Dracula. The key note speech on Stoker’s Dracula was given a Prof. of Gothic literature. The speech would begin the discussion for the workshop which took place the following day. The workshop itself was a wonderful gathering of vampire enthusiasts; from professors in the field to graduate students to a few select authors and independent researchers. Topics covered included, but were certainly not limited to: The possible location of Dracula’s Castle the impact of vampire texts upon actual locations; family dynamics in vampire film; to people who self-identify as ‘real’ vampires in one form or another. Each speaker was amazing and had something very unique to offer to the building group discussion and I was honored to be a part of it. 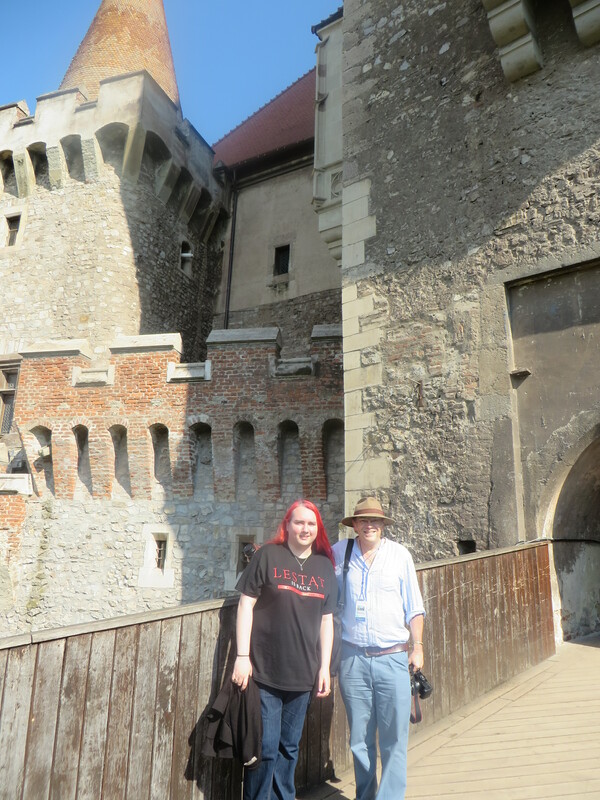 The last day of the conference was a group tour into Transylvania where the highlight of the visit was a castle which serves as a possible contender for a might have inspired Bram Stoker when he sat down to write the story of the now famous Transylvanian count. It was an impression, imagination-inspiring place, to say the least. I absolutely loved getting to explore Corvin Castle, but to have the opportunity to do so alongside a group of people who love the vampire story as much as I, made it absolute magic! 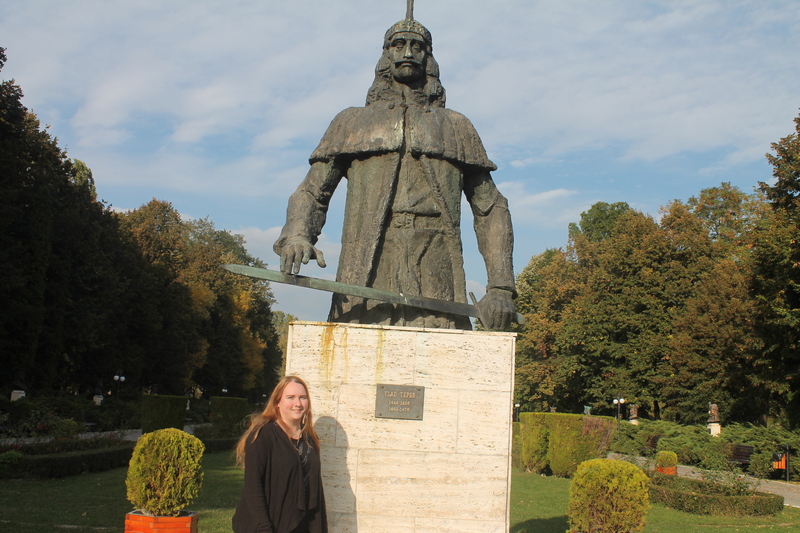 Last week, I took a research trip to Transylvania to explore the historical locations associated with Vlad Tepes. For those who do not know, Vlad Tepes was a Prince of Transylvania who ruled between the years 1448 – 1456 and 1462-1476 respectively. 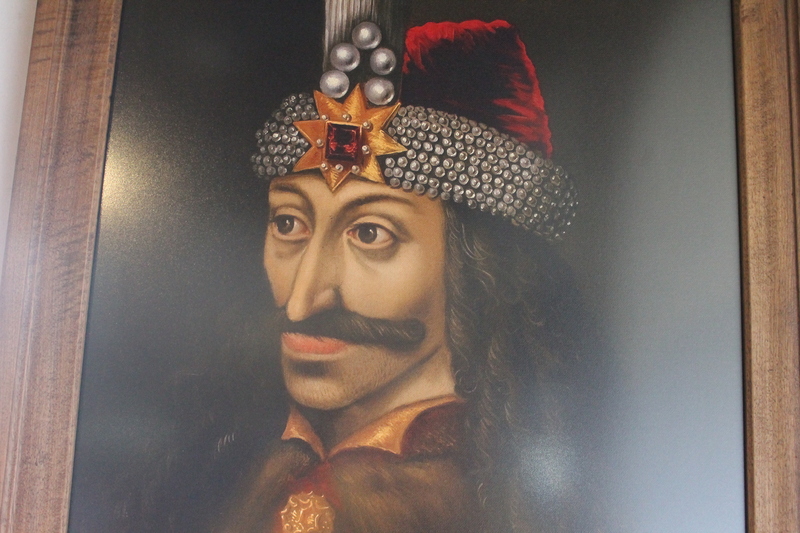 In Transylvania, Vlad is most often frequently remembered as a folk hero who fought off a Turkish invasion during his reign. However, his harsh tactics in battle and his use of various forms of painful executions earned him several more infamous names throughout history. One of these names is Vlad the Imapler, due to his reported affinity for executing vanquished foes by impaling them on large wooden poles. He is also associated with a much more famous name: Dracula. Meaning son of the Dragon, or in some stories, son of the Devil. This name goes hand-in-hand with tales of Vlad’s bloodthirsty and ruthless nature. These often sensationalized stories have grown in time with the proliferation of the famous novel, Dracula, first published by Bram Stoker in 1897. Now, back to my personal journey. It began in Bucharest, where I spent my first night in Romania. Initially, I was in awe of the city, in both positive and negative ways. To begin with the good, the city features a lot of history with some truly breath-taking views. 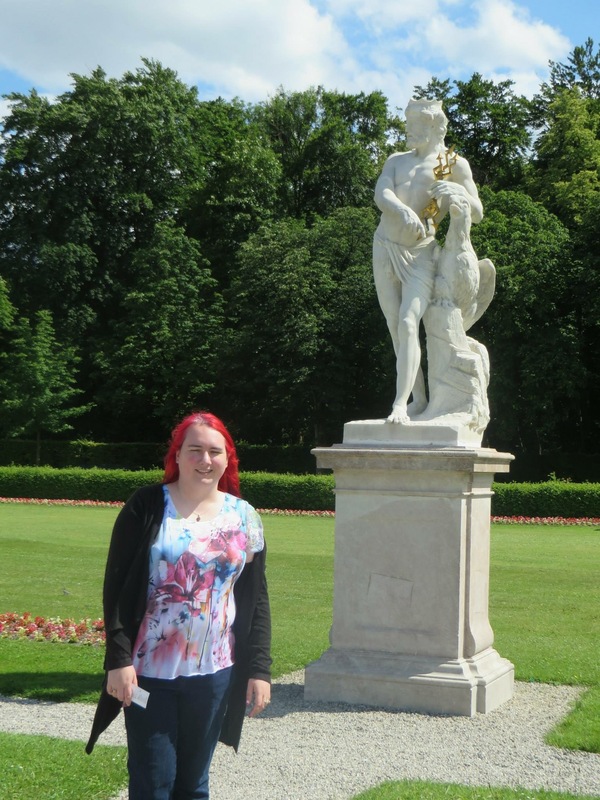 The buildings are very elaborate, and the streets were lined with grandiose statues, and gorgeous fountains. 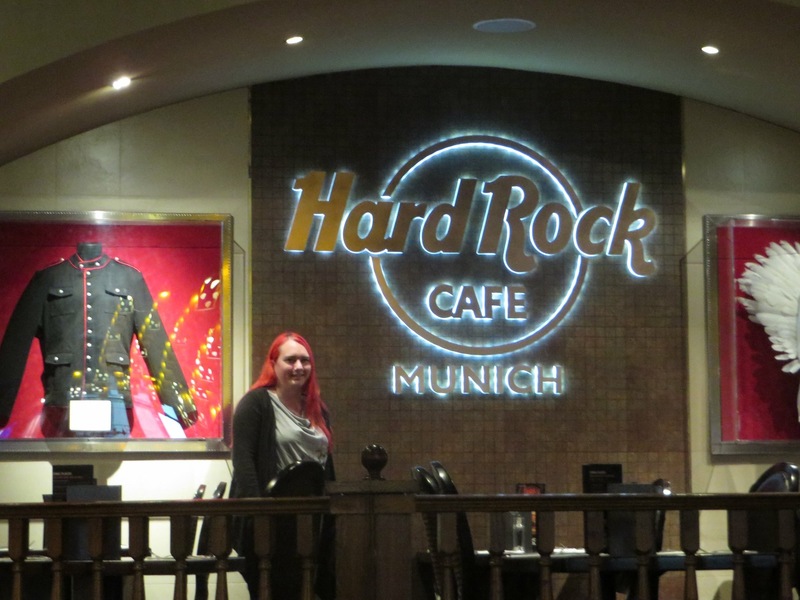 And of highest importance…Bucharest has a Hard Rock Café which, as an avid Hard Rock pin collector, was definitely a point in its favour. In the negative was driving in Romania, which I was fortunate enough not to have to do myself, as my father who took the trip with me did the driving. The streets were very crowded, sometimes consisting of up to six lanes which were completely lined with cars. The lanes were poorly marked, especially for night driving and there were a lot of round-abouts, some six lanes across with up the eight exits. The average speed of driving in Romania was probably 30mph, except on very specific highways. I say probably because road signs were not in abundance. The second day is when the real journey began. We had three planned stops on our agenda for the first day. 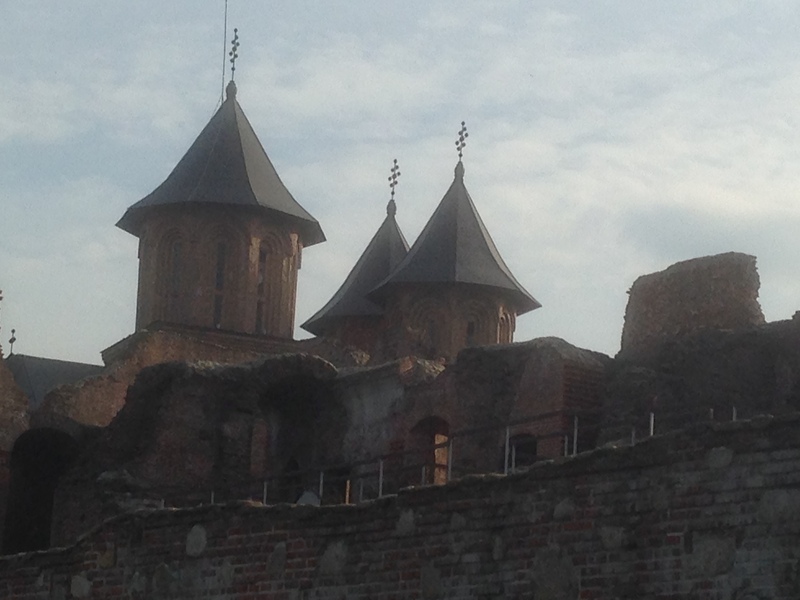 They were the Snagov Monastery; Princely Court with Chindia Tower in Targoviste; and our hotel outside of Bran Castle. The first stop was Snagov Monastery which took us about 45 minutes to reach. 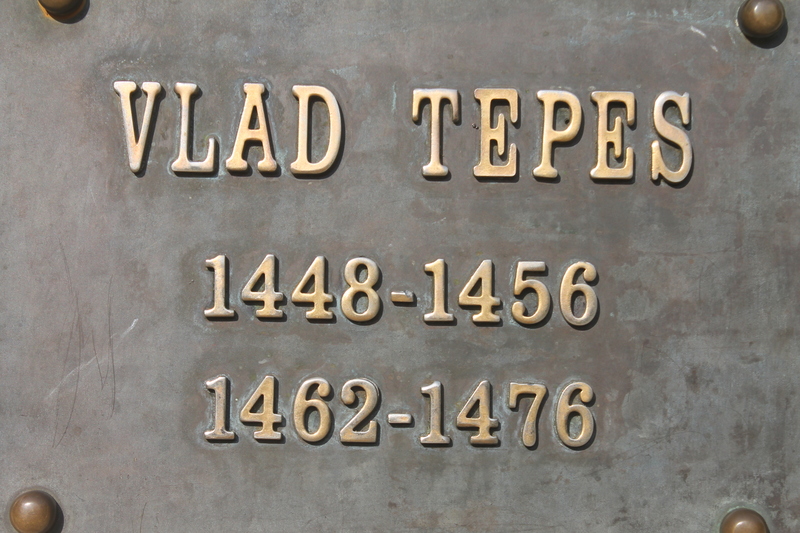 Despite having a map and a GPS, we did get lost a few times before finally finding a sign that not only listed name of the Monastery, but actually said Vlad Tepes. We ended up following the signs to what we planned on being our first stop. It was located in a small town down several poorly paved roads in a deprived area that was several miles the main roads. When we reached the monastery, there were a group of men standing outside of the building. One of these men directed us to park the car, which at first seemed fine. However, after we got out of the car, the man approached my father and stated that if we paid him, nothing would happen to the vehicle and that his companions would walk us into the monastery itself. My father, who is generally uncomfortable with very little, gave me a look that spoke volumes as this man continued that state that nothing would happen if we paid him. We said a terse, no thank you, and got back into the car without seeing the actual location. 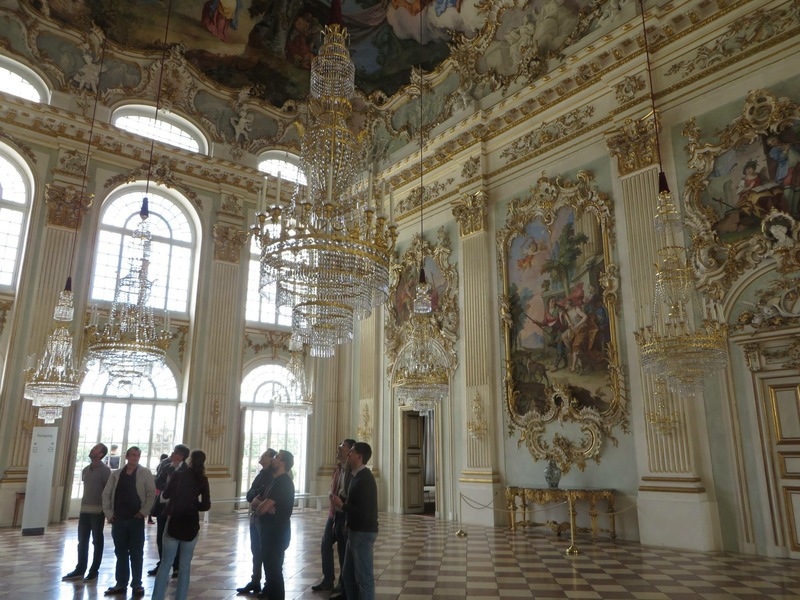 The second stop was Princely Court. It consists of two parts. 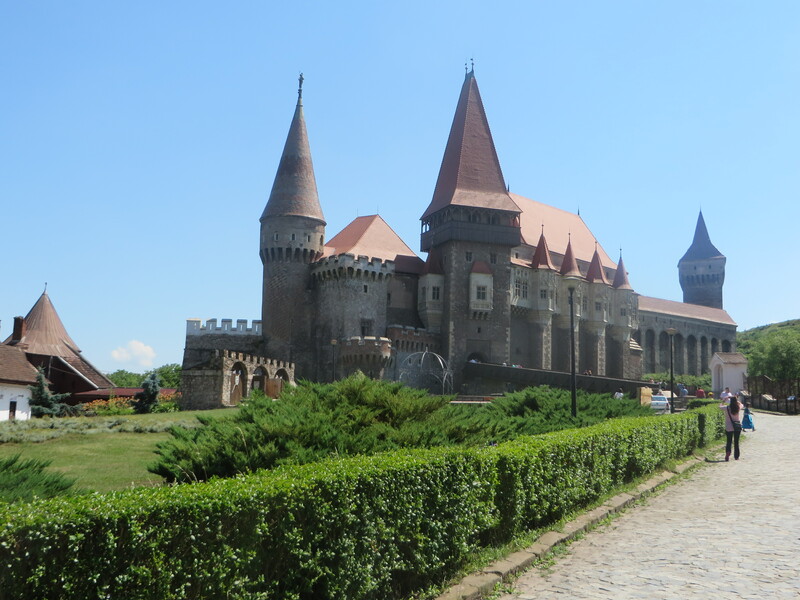 The first is a garden with several statutes of the Princes who have ruled over Transylvania. It was actually quite lovely and was filled with flowers between the statutes. 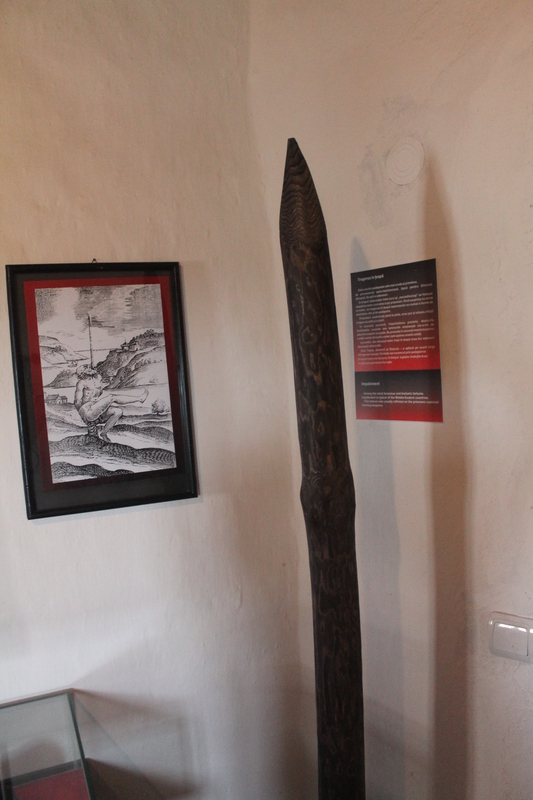 It also featured a rather touristy restaurant which advertised its association with Vlad Tepes. In the centre of the garden was a large statue of Vlad which towered over the ones surrounding it. We had a very enjoyable walk through this garden. 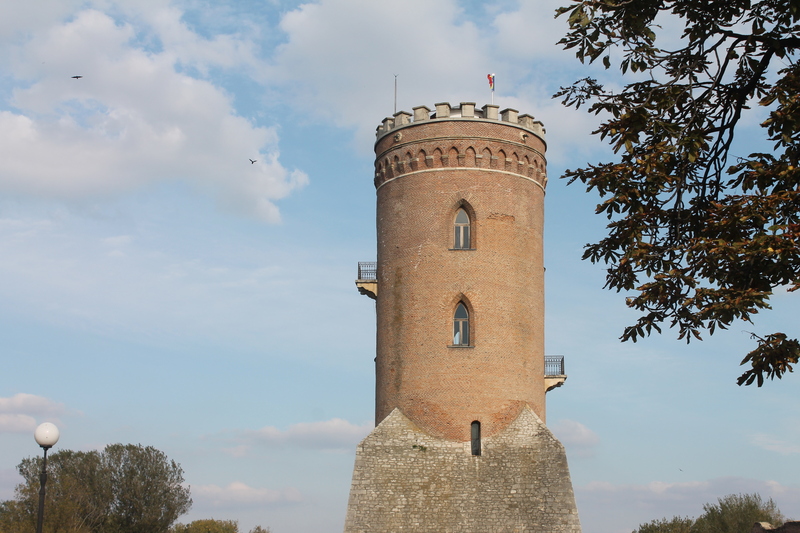 The second part is the Chindia Tower, which is also associated with the Transylvanian Princes. However, it turns out that this tower is closed on Mondays, so we were unable to go inside. 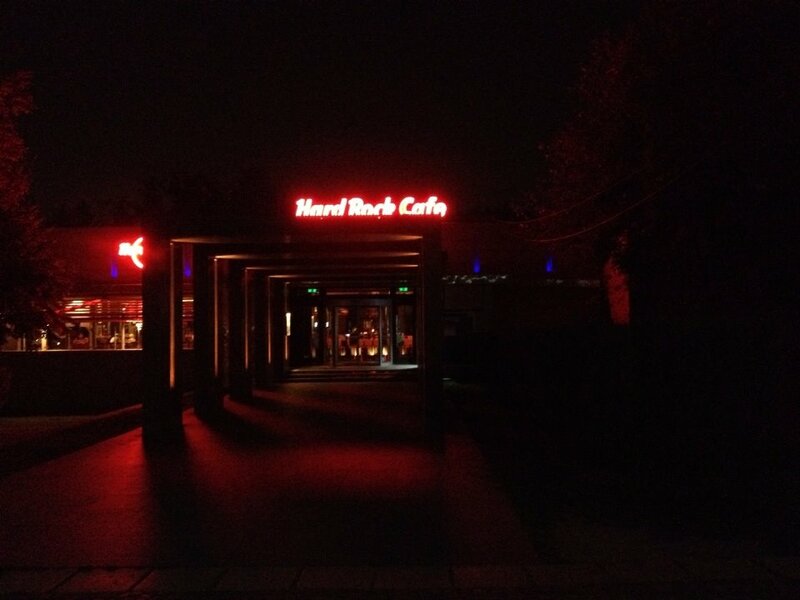 Though we did take several photographs of the outside. There was also a small restaurants called the Mcrama Murfatlar, which was both very reasonably priced and had excellent food and wine which is located between the Tower and the garden. 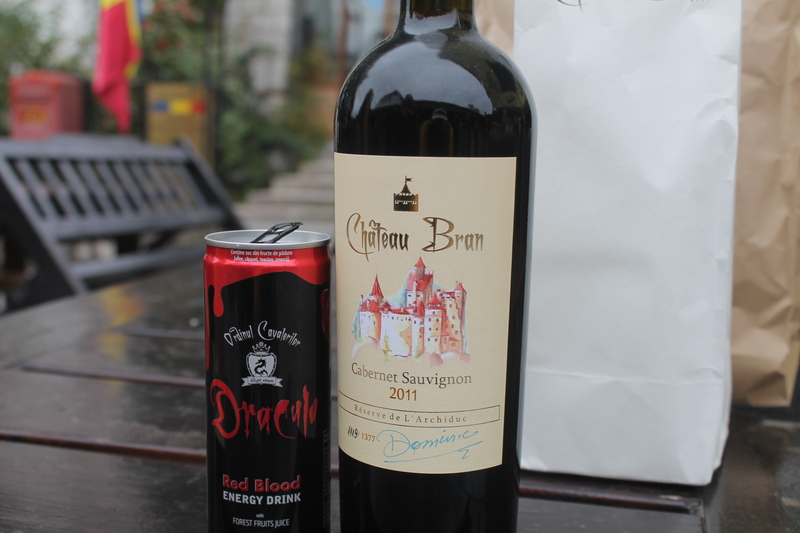 After this, we continued our journey towards Bran Castle. The drive up the mountains was a slow one, with the road full of sharp curves that had to be taken with the upmost care. The GPS and map estimates stated that it would take approximately 2 hours to make the drive, the reality (at least for our trip) was closer to 3 ½ . However, we did eventually reach the hotel by the castle and enjoyed a fun night of tasting some local wines. 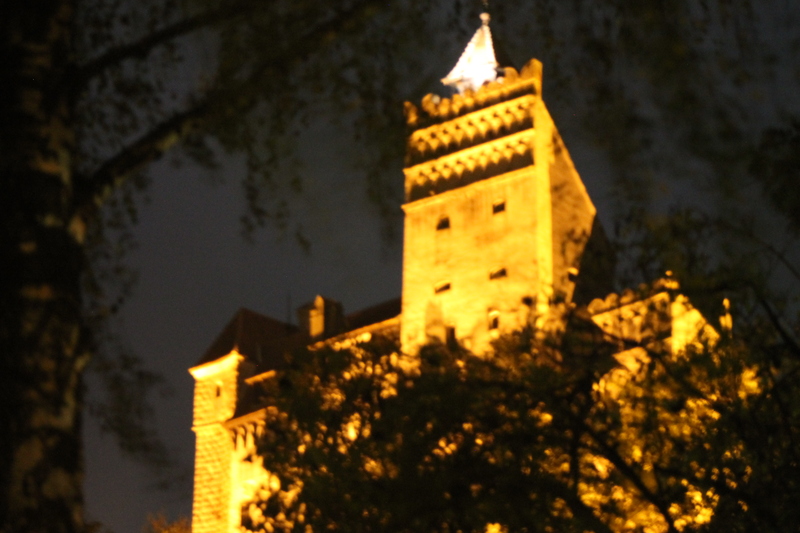 We also took a few night photographs of Bran Castle, which to me appeared both powerful and ominous upon the mountainside, allowing my imagination to understand how one might come to associate the castle with the myths and legends of the vampire. The next morning we explored the castle itself. 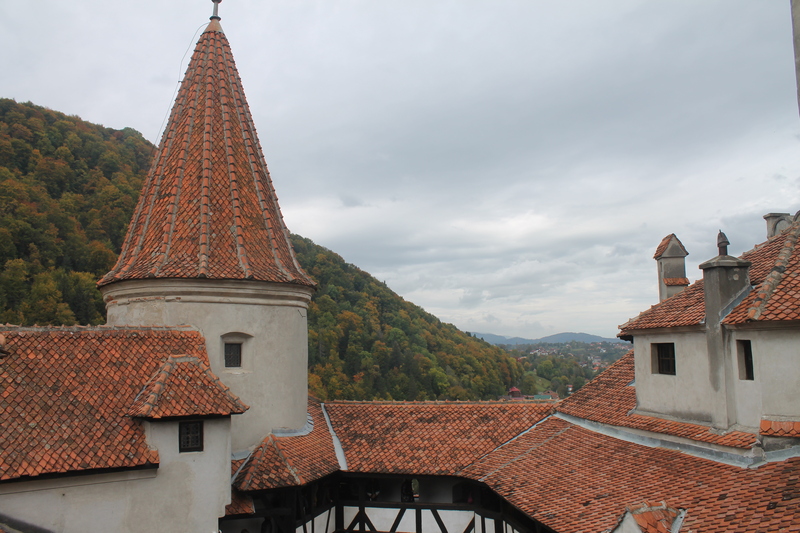 It held a great deal of history about the ruling families of Transylvania and the history of the castle itself along with some beautiful views of the surrounding mountains. It also featured a section on the vampire myths associated with Vlad, a room I spent much time exploring. 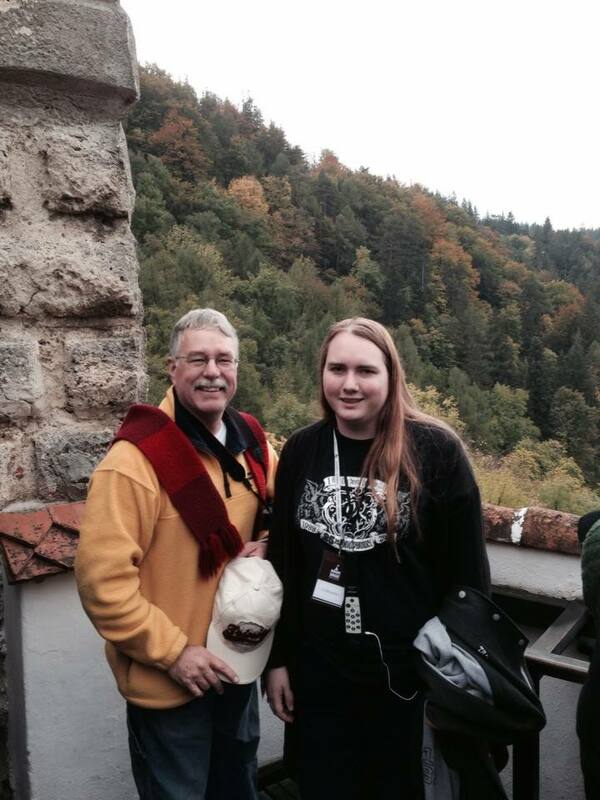 Overall, the castle was truly spectacular and well worth the tedious trip up the mountains. After the castle, we shopped the small, open-air market that was located near the entrance and picked up a few things for some friends. Also could not resist trying a few of the specialties. Afterwards, we headed back to Bucharest where we spent out last night trying a few additional local foods and drinks of the area, including an unknown Romanian liquor whose name I was unable to recall the next morning. Overall, despite a few complications, the trip was a good experience. It was really inspiring for me to be able to actually visit the locations which I have been studying and reading about for so many years. I feel very fortunate to have been able to take this trip and explore the history of the myths which inspired my imagination as a child and continue to do so to this day. For those who don’t know, in addition to being a writer, I am also a PhD student writing my dissertation on vampire fiction. 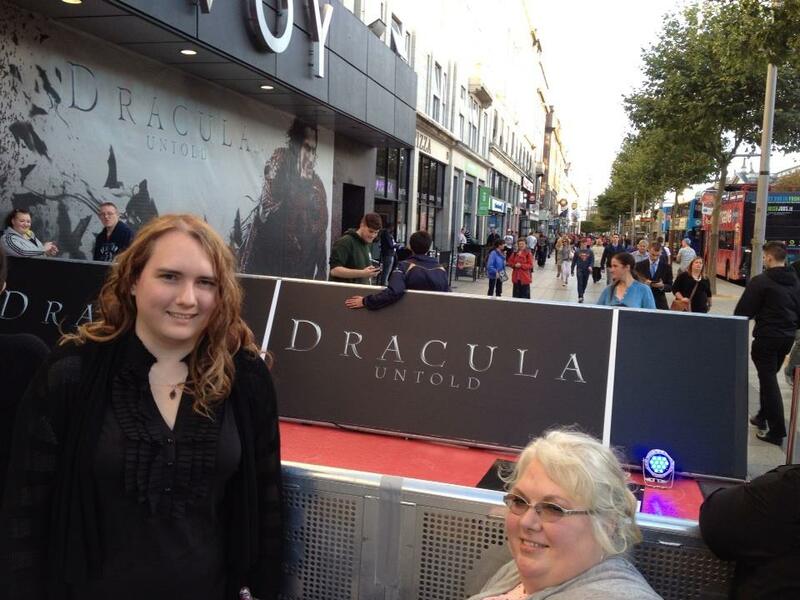 Therefore, I had a truly amazing opportunity the evening of Sept. 30th, 2014 to have the privilege of attending the red carpet premiere of the upcoming film, Dracula Untold. It was my first time to ever attend a premiere and the event which was held in Dublin, Ireland had all proceeds going to charity. The event did not disappoint and I was thrilled to be in attendance! Arriving only a few hours early, I was pleasantly surprised to find myself at the beginning on the line, close enough in fact to stand directly in front of the walkway which the stars of the film would later walk down. Though a bit chilly, it was interesting to watch the red carpet being uncovered and the slowly gathering crowd. The doors for the theatre opened around 6:30, an hour before the film was to begin, however I chose to remain outside for another half hour, give or take, to see if I could catch a glimpse of the cast. 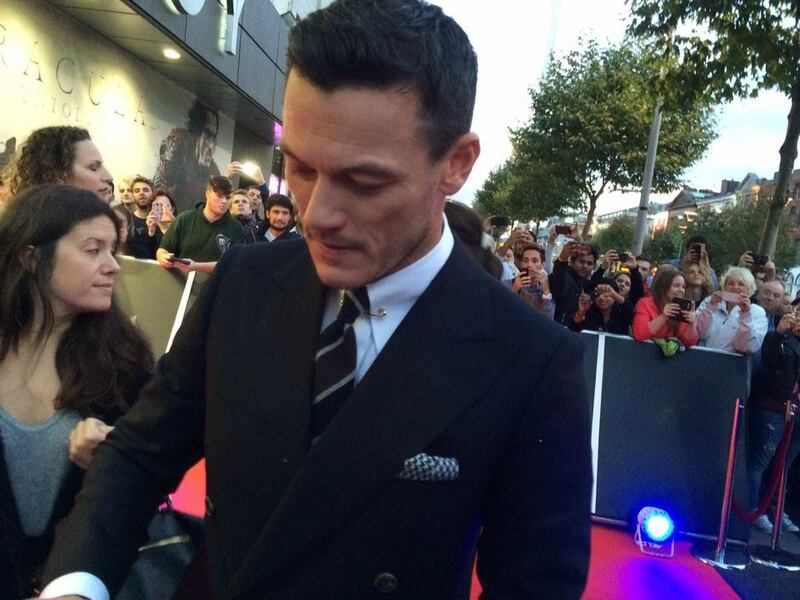 My efforts were rewarded as, a short time before the film was to begin, the star of the film, Luke Evans who plays the title role of Dracula, greeted the crowd as he walked down the red pathway. I enjoyed the film as a fun twist between history, myth and the cinematic portrayal of the vampire. The battle scenes were grand, but not so over-the-top that they became campy, which was nice. They also seemed to embrace (which was confirmed during a Q & A with members of the cast) that they were attempting to put a more human face on Dracula, showing how Vlad might have been seen by some as a hero, as he accepted vampirism in order to save his people from the Turks. I actually asked Luke Evans about his preparation for the role, which he said included a fair amount of research, and definitely seemed to show in not only the film, but in other questions which he answered during the Q & A as well. 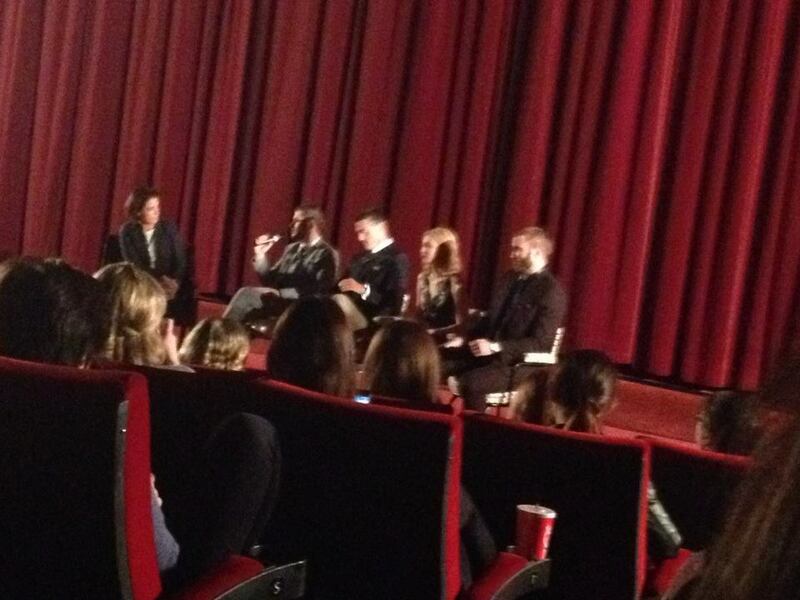 They were joined in the Q & A with the director of the film, who provided some fun insight as well. Overall, I enjoyed the film and had a great time at the premiere!